At one end of Chinatown, in what was once an otherwise unremarkable temple of Wat Traimit, sits the world's largest solid gold Buddha image. Made of about 83% pure gold and weighing in at five and a half tons, the 15-foot tall seated image is worth millions of dollars at today's gold prices. Wish you could have this information with you when you visit Bangkok's Chinatown? Now you can. Check out our Bangkok Walking Tour ebook. The image has a colorful history, which is recounted in a free pamphlet distributed with your paid admission. The Golden Buddha was cast sometime in the 13th century and is an excellent example of the gracious Sukhothai style that is still very much in favor to this day. At some point, it was covered in plaster and lacquer, most likely in an attempt to hide the valuable icon from thieves or looters. The disguise was so good that everyone apparently forgot about what was hidden beneath. A member of King Rama III's court had the statue moved to Bangkok and installed in a temple near where the Oriental Hotel is today. That temple fell into disuse and was completely abandoned around 1931. 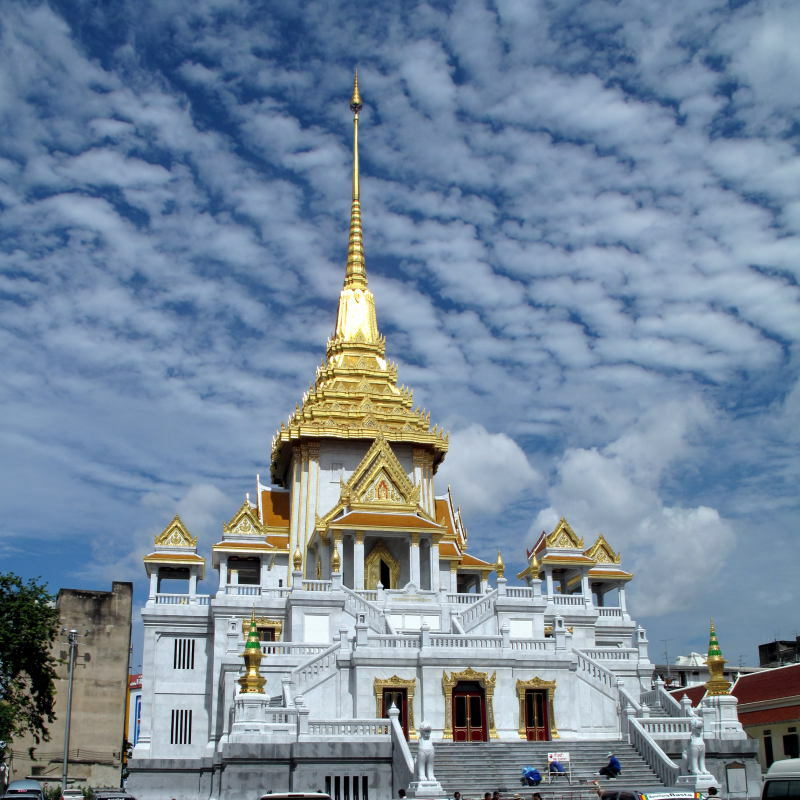 The true nature of the Golden Buddha wasn't discovered until it was moved to its present location at Wat Traimit in 1955. When the image was being hoisted into its new home, the ropes broke, dropping the statue. Some of the plaster was chipped off, revealing the gold underneath. Bits of the plaster are on display in the interpretive center below the chapel. The statue now sits in a new (opened in early 2010) chapel perched high atop a four story marble-clad ziggurat. The second and third floors of the structure house an interpretive center. The second floor exhibits cover the history of the Chinese community in Bangkok, starting with a 3D presentation and moving on through slice-of-life scenes of Chinese traders in years gone by. The third floor museum covers the history of the Golden Buddha image itself. The video presentation at the beginning provides a good brief background on Buddha images in general, as well as the full story of the "subduing Mara" pose for this image. The exhibits cover how the image was made as well as the historical background of how it came to be at Wat Traimit. 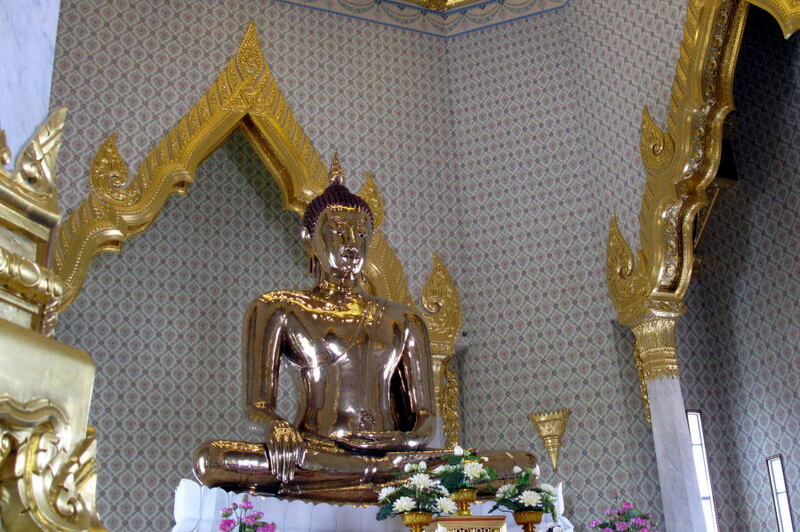 See my Chieng Fa Travel Journal for more pictures of the Golden Buddha and Wat Traimit. Entrance to see just the Golden Buddha is 40 Baht (1.04 USD). The museum costs an additional 100 Baht (2.60 USD). Tickets may be purchased at a booth near the wiharn housing the image. There are also currency exchanges in the same kiosk. The temple is open 8:00 am to 5:00 pm everyday, but note that the museum is closed on Mondays.